Warning: Eating less is making you fat! We are told that “eating less and exercising more” is the secret formula to losing weight. You may have also heard about calories in vs. calories out – a simple way to tell if you are going to lose weight. You’ve been following these known “rules” for months and are still not seeing results, and this has left you frustrated and ready to park yourself on the couch and eat chocolate cake for dinner. Please hold off on that idea and consider a different approach. Have you considered that your calorie intake might be too low? 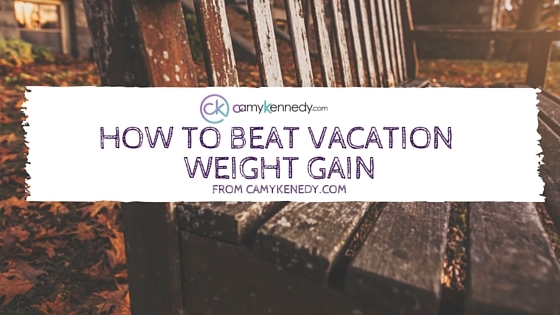 Initially, a calorie reduction will cause you to lose weight. However, you are not only losing fat, but also valuable muscle tissue. Loss of muscle tissue decreases your daily calorie burn, and ultimately lead to reaching a plateau. In this case, eating less does not equal losing weight long term. So how can you lose weight by eating more? I’m glad you asked! There are three steps to creating a nutrition plan that works to stabilize blood sugar, release your bodyfat and keep it off long term. Lastly, the calories per meal matters. For women, and ideal “meal” is between 250-300 calories and for men the meal should consist of 350-400 calories. Now, let me show you how easy it is to eat more and lose weight! Below I’ve created a sample meal plan for both women and men, just keep in mind the men will have about an ounce of protein and carbs to get the calories into the 350-400 range. This change in mindset will not only make a change in your body, but it will also provide more energy for your daily life. 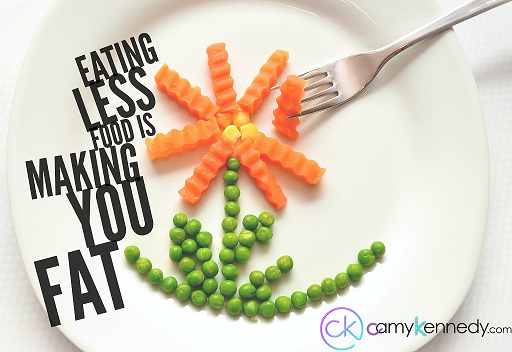 Let’s stop restricting and cutting back, when we can actually eat more food and still lose fat!